In the following article, we will compare two Canon DSLR cameras that are available in the same price range, which are Canon Rebel T5i and Canon Rebel T6. Well, as a matter of fact, Canon Rebel T5i is actually a little bit more expensive than Canon Rebel T6. But the price difference is quite scalable. 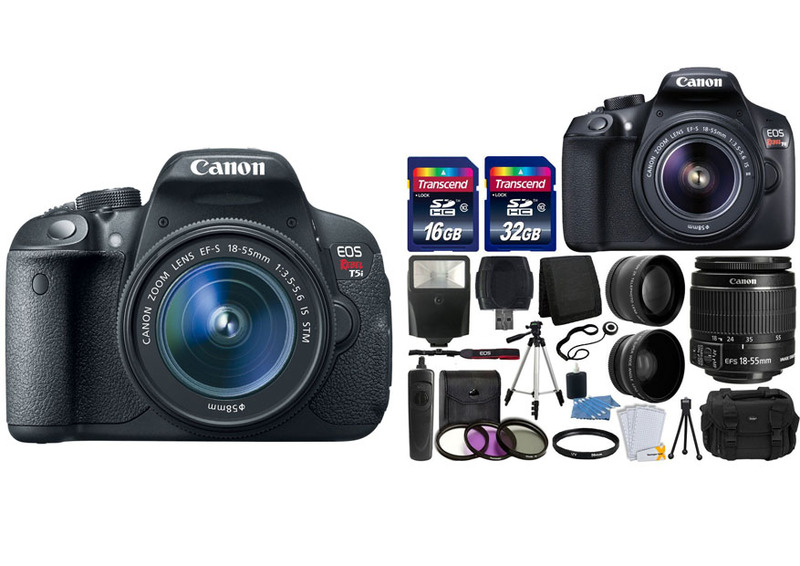 With the amount of money for getting the Canon Rebel T5i, you can get Canon Rebel T6 with complete accessories. In addition, Canon Rebel T6 is a newer model. Still, before you make a hasty decision, make sure that you understand the differences between these two models so that you can make the right choice. Although Canon Rebel T6 is newer, you need to note that it is designed to serve as an entry-level model. So, the overall value and performance will not be really comparable to a higher model, despite it being newer. Canon Rebel T5i is a higher model that offers a number of improvements and additional features – see our previous post about Canon Rebel T5i vs T6i here. Canon Rebel T6 is equipped with a 3.0-inch fixed display screen. The screen resolution is 920k dots. Well, the resolution is very good. But the lack of an articulating screen is a minor drawback. Compared to Canon Rebel T5i, this camera is a little bit smaller and lighter, so you can say that it is a tad easier to handle. Canon Rebel T5i features a 3.0-inch articulating touchscreen. The screen resolution is higher at 1040k dots. The display is definitely much better. The images are sharper and clearer, and the touchscreen control is very intuitive. The articulating display is very nice. Additionally, Canon Rebel T5i comes with a microphone port and a flash sync port. These are very handy. The microphone port makes this camera viable for more serious video projects, and the flash sync port enables you to use an external flash with ease. Perhaps the only real advantage that Canon Rebel T6 offers is the built-in Wi-Fi. As a newer model, it is not surprising that Canon Rebel T6 is finally equipped with built-in Wi-Fi. That’s already a very common feature in today’s digital cameras. Canon Rebel T5i does not have built-in Wi-Fi, but honestly this is not a real problem. If we compare the performance of Canon Rebel T5i vs T6, it is clear that Canon Rebel T5i is of a higher class. It offers a number of advantages. For example, there is a prominent difference in the AF system. Canon Rebel T5i has more focus points with on-sensor phase detect, which enable it to be faster and more accurate than Canon Rebel T6. In addition, the continuous shooting speeds are better – Canon Rebel T5i is able to shoot at 4.8 fps, as opposed to Canon Rebel T6’s very limited 3.0 fps. Finally, the maximum ISO of Canon Rebel T5i is also higher, which is 12800 (extendable to 25600). So, you can expect the ISO performance to be better in challenging light conditions. All in all, Canon Rebel T5i is the more recommended choice. The features and performance are much better. It has an articulating screen, a more powerful AF system, higher continuous shooting speeds, and higher maximum ISO. The external mic jack and flash sync port can also come up handy.